March 25, 2019– Representatives from EDC’s throughout the Valley met with more than 20 legislators and top government officials to bring the voice of Central Valley businesses to the Capital. On the list of top priorities for the valley were Workforce Development, Infrastructure Development, Regulatory and Tax Reforms, Opportunity Zone and Tax Incentives. Central Valley priorities were presented in comparison to a list of top site selection factors for business. In addition to valley legislators, the group met with the Assembly Committee on Jobs, Economic Development and the Economy; the Governor’s Office of Business and Economic Development (GoBiz), and California Manufacturing & Technology Association officials. As manufacturing is a large and still growing economic part of the Central Valley, the role of investing in Workforce Career Technical Education (CTE) has never been more important. CCVEDC supported the State in continuing to invest and, if possible, increasing investment in Career Technical Training. Specifically, advanced manufacturing, value-added agriculture, logistics, and technology development. “Workforce and Economic Development in the Central Valley have worked together hand in hand for more than 30 years, leveraging each other to the benefit of business and residents. 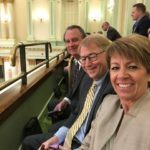 The legislators from the Central Valley understand and support the continued investment in this collaborative effort and the positive economic effect produced by this partnership,” stated Lace Lippincott, CCVEDC and CCWC Board Member. The Central Valley is experiencing significant economic growth and activity. Yet, infrastructure development has been left behind and is needed to attract and grow jobs in this critical transportation corridor. The Central Valley is a prime location for advanced manufacturing, distribution, energy development, water technology among other sectors which support California’s identity as an innovation leader. 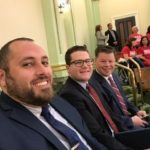 “It is important for our state legislators to be aware of the unique issues of the San Joaquin Valley. Water issues effect more than just farming operations, it effects all the other ancillary industries that thrive because of agriculture.” noted Bobby Kahn, CCVEDC Board Member and Treasurer. Of California’s four million businesses, 3.1 million are sole proprietorships and 87% of companies have 20 or fewer employees. A complex regulatory process creates a significant burden on small businesses, causing many to consider leaving or expanding outside of the state. “A vibrant entrepreneurial ecosystem in the Valley and the State is vital to the economy. Indeed, a region’s startup activity is a key factor in overall economic growth. It is critical to for these companies to be provided with relief from onerous regulations that hinder future investment and job creation,” according to Richard Chapman, CCVEDC Board member. According to business, tax credits and other incentives can go a long way toward boosting capital — especially when the project involves job creation or a major capital investment. The new Opportunity Zones program is attractive, but hard to access and understand. Incentives allow manufacturers a chance to recover costs expended for workforce, research and expanding/staying in California. “We encourage the legislature to conform state tax law to federal tax law treatment of Capital Gains under the Opportunity Zones incentive which will bring new investment and jobs into center city areas in need of redevelopment. Thirty-four other states have adopted state tax conformity provisions, but California has not. The Central Valley is home to over 150 Opportunity Zone census tracts that represent some of the most disadvantaged communities in nation,” stated Mike Ammann, CCVEDC board member representing San Joaquin Partnership. CCVEDC is a not-for-profit Corporation whose mission is to attract and retain jobs and investment in the Central San Joaquin Valley counties of San Joaquin, Stanislaus, Merced, Madera, Fresno, Kings, Tulare and Kern. They are supported by the 8-counties in the Central Valley, Central California Workforce Collaborative, PG&E and Central Calif/Central Mother Lode Regional Consortium (CRC) Partnership. The plastic injection molding company JATCO Incorporated is relocating from Union City to Modesto, CA. The plant makes a wide range of plastic products. The company is bringing 150 jobs to the valley, which will begin hiring this month. It turns out there really is in great future in plastics. At least there is now in Modesto. The plastic injection molding company JATCO Incorporated is relocating from the Bay Area to the Central Valley and will bring some 150 jobs with it to the new headquarters. Founded in 1976, the company has been in Union City since 1985. But recently it has looked toward the Valley to relocate, including spots in Stockton and Turlock. Company president Steven Jones said Modesto won out because of the help of the city’s economic development team and the county’s Opportunity Stanislaus program. An aerial view shows two current buildings at the Gap campus near Fresno Yosemite International Airport. By nearly every metric — employment, wages, farm receipts, home prices, construction — 2018 proved a banner year for Fresno County’s economy. And in the opinion of economists, economic development professionals, industry advocates and more, the good times are expected to continue into 2019, even though a number of negative factors may loom over the horizon. In Fresno, 2018 was a pivotal year that saw California’s fifth-largest city join the ranks of other e-commerce hubs. Fulfillment centers for Amazon and Ulta came online, bringing Mayor Lee Brand even closer to his goal of creating 10,000 jobs in two terms. Gap was another large acquisition for Fresno. The San Francisco-based retailer announced it would locate an e-commerce fulfillment center in Fresno at its existing campus near the Fresno Yosemite International Airport. The decision will create at least 515 full-time employees and generate $80 million in capital investment. There are also some bright spots when it comes to the development of more shovel-ready industrial land, which has been a problem for site selectors in the past. The 63-acre Palm Lakes Business Park near the airport recently welcomed its first tenants. Closer to the Amazon and Ulta sites in south Fresno, Caglia Environmental’s proposed 110-acre industrial park won council approval this year, but still faces a challenge to its environmental impact analysis. While continuing to market to e-commerce operations, Fresno economic developers are shifting their sites to tech companies that may be considering moving some of their operations out of the expensive Bay Area. Larry Westerlund, Fresno’s director of economic development, recently said in a public talk that closing the skills gap with our local workforce would net the well-paying jobs Fresnans hope for. Speaking of technology, Clovis— Fresno County’s fastest growing city — should next year see a major new project at its Research and Technology Park near Temperance and Alluvial avenues. Construction for the College of Osteopathic Medicine in Clovis started this year. As part of California Health Sciences University, the 100,000 square foot facility would be the Central Valley’s first medical school when it is finished by next year, with classes set to start in 2020. Clovis Community Hospital is also expected to start adding additional facilities next year. More industrial space is also primed next year for the Clovis Industrial Park and Dry Creek Industrial Park. “It’s really encouraging to see that commercial industrial demand going in Clovis,” said Andy Haussler, Clovis economic and community development director. Fresno County farms continue to comprise one of the most valuable farming areas in the world, though a number of factors justify calling the current market conditions “stable,” said Ryan Jacobsen, CEO and executive director of the Fresno County Farm Bureau. Water supplies and labor availability have been perennial issues, but now tariffs on crop exports to countries such as China add a new layer of concern. One of the Valley’s top crops is the prime focus of those tariffs, and a potential source of pain in a protracted trade war. High-speed rail construction activity will continue in Fresno County in 2019, and Lee Ann Eager, president and CEO of the Fresno County Economic Development Corp., is bullish on the county’s chances of landing a rail heavy maintenance facility. She recently said she has heard rumbling the site could be chose in early 2019. It would add an estimated 1,500 new jobs, which is why bid packages from areas around Chowchilla, Madera and Hanford are also in the running. The small communities along Highway 99, such as Fowler and Selma, continue to see new development that should stretch into 2019. Eastside communities including Sanger, Reedley and Parlier are also seeing activity. Impoverished Westside communities continue to face challenges, but the recreational pot industry has created bright spots in communities that have welcomed it, namely Coalinga and Mendota. Cannabis-related industrial development will ring in the New Year in those towns. A potential market slowdown does weigh on the minds of economists and economic developers, some of whom — namely in Fresno — have described a rush to build to beat a downturn. Haussler with the City of Clovis has a background in economics and calls himself a “armchair Wall Street Journal reader. He thinks 2019 will continue to see the good times roll. But, he added, 2020 may be a different story. It’s just too far out to know for sure in this time of uncertainty. At Heartbeat Boxing near Downtown Fresno, there’s no shortage of quick feet, fast punches and passion. Owner Gilbert Ruiz is proud of the facility growth at Los Angeles and Van Ness. He’s also had some business help from small business advocates and experts from Access Plus Capital. “They’ve just been a big coach in starting our business from our business plan to projecting where our business is going to go to secure loans and future loans, because we are growing, we are growing very rapidly.” Ruiz said. Recently, Access Plus Capital was awarded a Go-Biz grant from the Governor’s office, which gave out $17 million statewide. Access Plus Capital received more than 100,000. About 70 percent of loans given out are to minority owned businesses. “It’s going to help us expand our support to businesses, especially on the pre-loan side. We work with businesses at no cost to the businesses to help them with their business plan or marketing or finance. 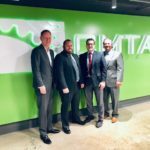 It’s going to allow us to do more support particularly to small businesses in our rural communities,” said Tate Hill, Access Plus Capital senior manager. Access Plus also received another major national grant from Chase Bank and the Central Valley Community Foundation called Pro Neighborhoods. The $5 million grant will help support small businesses in a variety of ways, but to support neighborhoods with housing and small business development. About $2.5 million will be lent out and focused in urban areas. “Impacting low-income neighborhoods and neighborhoods that have been environmentally and economically challenged,” Hill said. Companies that are interested in the funding and resources can reach out to Access Plus Capital. Officials say programs like this help boost business in the Valley.